I had a feeling that I had done quite well in picking 7 players and a team defense in the Sky Sports (UK based) weekly NFL fantasy football competition after 6 of my 7 picks had absolute monster games last Sunday. The likes of Chris Johnson, Andre Johnson, Ray Rice and Drew Brees performed admirably and my few secret picks were doing pretty well too. In this game you get to change your line up every week (1 QB, 2 RB, 2 WR, 1 TE, 1 K, 1 team defense) all within a set budget. Well to cut a long story short any score of 150 or over will see you in the top 100. I calculated that by the end of Sunday night I had 152 points and still had Vernon Davis yet to play on Monday Night Football against the Cardinals. To say I slept light was an understatement of epic proportions. Tuesday morning first thing I did was go online on my phone to check the MNF result and discovered that Davis had a poor game yardage wise (37) but a touchdown, making my total score 161. With that in mind I started dreaming that I had won the weekly contest, which means an NFL football, an NFL shirt and a one in eighteen chance of winning tickets to the Superbowl in a season ends prize draw. I had won the weekly contest around this time of the season about 4 or 5 years ago and got a huge buzz from seeing my name on tv, as well as having Nick Halling make a sarcastic comment about me (following the many emails I used to pepper the Sky Sports studio with). I checked the standings around 1pm on Tuesday during my lunchtime on my phone and was absolutely gutted to find out that I finished joint 9th. Some guy called ‘big shooter’ managed to get 175 points, using many of the same players as I had, except he had DeSean Jackson on his team, and he to me was the so-called ‘x-factor’, unlike Joe McElderry who will in 12 month be the z-factor. ‘big shooter’ certainly hit his target in week 14. All I can do is reload my weapon and fire it a bit more accurately in week 15….and no I wont be revealing my team to anyone until the week is over ! Good luck to all Sky Sports fantasy NFL players and I look forward to seeing more of Britball superstar Mark Cohen in the Sky Sports studio. Is Thomas Jones the most underrated running back in the NFL? Thursday Night Football (Dec 3 2009) was hardly the greatest advert for NFL football, but it did have at least one magic moment. New York Jets running back Thomas Jones, who has been more ‘under the radar’ than a Russian sub in the Cold War, reached his fifth consecutive 1,000 yard rushing season. Considering he was not seen as a fantasy stud at the start of the 2009 season, Jones has shown the skills that makes a running back quite special. He has tremendous durability, and Thursday’s game was his 60th consecutive game in the backfield. At present Jones is scheduled to rush for 1,424 yards, his best ever total in his 10 years of NFL football. The Jets stand at 6-6 and have a shot at a Wild Card (just about) despite rookie QB Mark Sanchez doing his best to throw the ball to the other team. Jones has helped to stabilise the J-E-T-S with his great vision and gutsy running. With Shonn Greene the rookie RB waiting in the wings Jones has been inspired to play some fantastic football, having only fumbled twice (and lost none) in 239 carries so far this season. Jones is only 1,117 yards away from 10,000 rushing yards, putting him 30th in NFL history, having already surpassed legends such as Jim Taylor, Roger Craig, Priest Holmes and Larry Csonka in the all time regular season rushing charts. I say give some respect to Jones. This is a player who played for the Chicago Bears in a Superbowl and finished with more rushing yards (112) than Walter Payton (61) did in his only Superbowl performance, and Jones has another feat over Payton in that he scored a Superbowl touchdown too. I read that Jones’s mother worked night shifts in a coal mine, talk about being inspired from an early age. 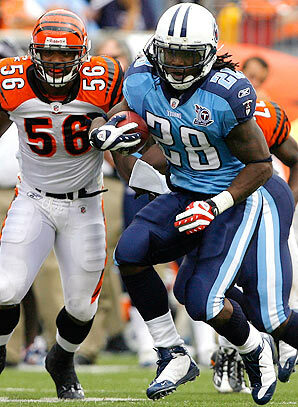 Jones deserves another Pro Bowl appearance to go with his 2008 appearance (his only one in his career) but I suspect that he may be overlooked by the mind blowing season being had by Titans speedster Chris Johnson. I hope for the sake of Jones and his family that the Jets win out and finish 10-6 but I suspect 8-8 will be where they will finish and Jones’s season will be lost amongst the annals of faceless NFL statistics.